1: The club was formed in 1992 following the merger of Northamptonshire rivals Rushden Town and Irthlingborough Diamonds. 2: Originally belonging to Irthlingborough Town, Nene Park was chosen as the club's base owing to its expansion possibilities. They had originally moved to the site in 1969. Over the years the stadium and its surroundings were upgraded for the total cost of £30 million.The first stand to be renovated was the North Stand, initially with a capacity of 1000. The rest of the ground progressed in stages with the East side the last to be the last. Named 'The AirWair stand, it was the most impressive, with a capacity of 2,372. 3: Starting in the Southern League Midland Division, they missed out on promotion in their first season, finishing 3rd behind Nuneaton Borough and Gresley Rovers. Promotion was achieved to the Premier Division in 1993/94. 5th place represented a decent first season with the title to follow in 95/96. 4: Promoted to the Conference, they finished 96/97 in 12th. After 4th placed finishes in their next 2 seasons, they finished 9 points adrft of league winners Kidderminster Harriers at the turn of the century. 2000/01 saw them put that right, finishing 6 points clear of Yeovil. 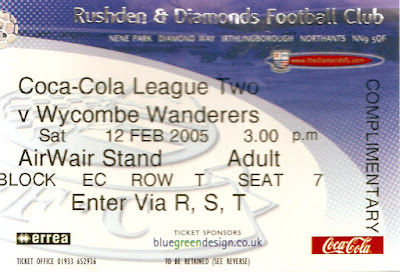 They would return to the Conference for the 2006/07 season, generally finishing around the mid-table mark, with 4th place being the best they could manage in 2010 in their second spell. 5: In their first Football League season they finished 6th in Division 3, which was good enough for a shot at the playoffs. After beating Rochdale in the semis, they lost 3-1 to Cheltenham Town at the Millenium Stadium in Cardiff. They put things right in 2002/03, earning promotion as league winners. The rest of their time in the league would see them struggle with their only season in Division 2 seeing them finish 22nd. They finished the same placing in the newly branded League 2 the following season, finishing bottom of the Football League and being relegated in 2005/06. 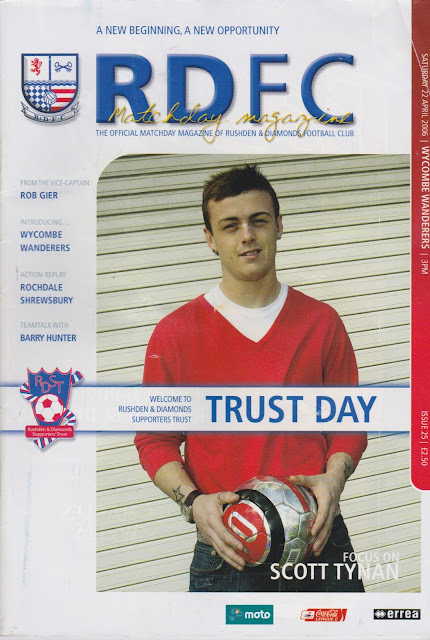 6: Rushden & Diamonds best ever seasons in the FA Cup game in 1999 and 2000. They reached the 3rd Round in those years, taking each game to a replay. They lost 3-1 to Leeds United on the first occasion, taking Sheffield United to penalties on the second before bowing out. 7: Little success was had in the League Cup, with the second round proving their limit. On the second of the 2 occasions that they did progress they lost 8-0 to Coventry City in the 2002/03 season. 8: They reached the FA Trophy semi-final in 1994/95, losing to cup specialists Woking 2-1 on aggregate, in spite of a 1-0 win in the home leg. They'd go on to reach two further Quarter finals in 2000 and 2008. 9: Their best ever attendance came in 1999 when 6,431 turned up for the visit of Leeds United in the FA Cup. Their biggest ever win came at troubled Weymouth in 2009 where they won 9-0 against a team comprising of youth teamers following the release of the whole first team due to financial issues. 10: 2010/11 would be their last ever season which saw them finish 13th in the Conference after a poor end to the season. Due to financial issues they were thrown out the competition. A fan-led club - AFC Rushden & Diamonds would start the following season in youth football, progressing to the United Counties League the following year. Since then they have progressed steadily up the pyramid and currently sit at step 4 in the NPL D1 South. 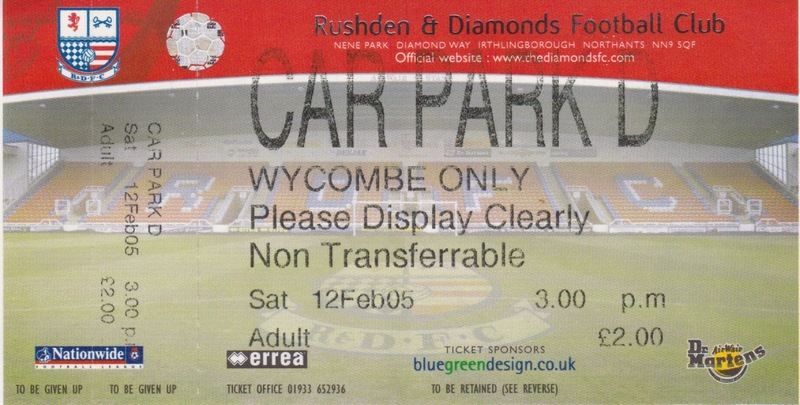 Prior to this they were in the Southern League Central, but were moved due to geographical reasons. Wycombe first ever visit to Nene Park was a poor day for the Chairboys. Things started badly for Wycombe as early as the 3rd minute, when Wycombe keeper Frank Talia raced out of his goal to challenge a high ball with Diamonds striker Onandi Lowe, made a hash of it and was sent off. We had no keeper on the bench so Steve Brown and Richard Harris took their turns in playing in goal. 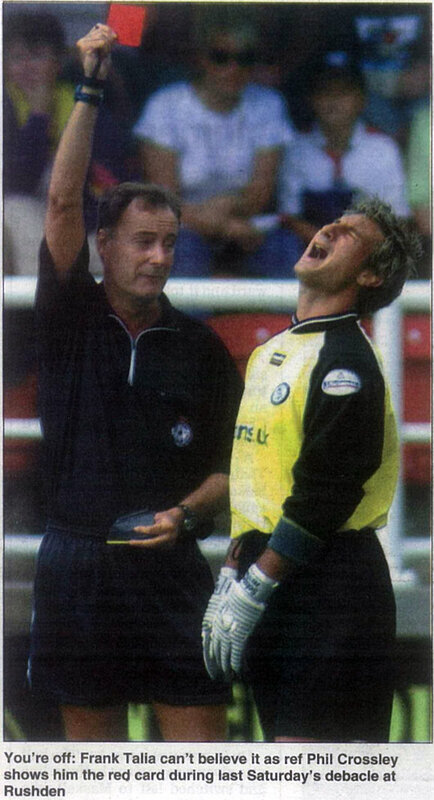 Chris Vinnicombe was also sent off for a second yellow card later on in the game, whilst Lawrie Sanchez was also sent to the stands for saying something to the referee. In the end, despite a good performance and lots of chances for Wycombe, goals from Onandi Lowe and Rodney Jack consigned Wycombe to defeat and put them into the bottom 4, where they would end the season, despite changes of manager. My second visit to Nene Park was a lot better than the first, result wise. Over 500 Wycombe fans travelled to Northamptonshire as John Gorman started to make good the mess that he had inherited from Tony Adams back in November. We'd lost at home to Boston United the previous Saturday and it looked to be the same old story when Graham Allen converted David Bell's cross to give Rushden the lead on 50 minutes. Minutes earlier Wycombe keeper Frank Talia had been lucky not to see red for the second successive year at Rushden as he again handled outside the area, but he was only booked. The hosts missed a string of chances and we looked to be beaten but Matt Bloomfield's excellent 25-yard strike came against the run of play to level things up. Still Wycombe struggled to get a grip on the game but Nathan Tyson's last minute close range win created a smash and grab win for Wycombe that was very cruel on the hosts. This was at the height of my Wycombe Wanderers obsession with me seeing 74 games across all of Wycombe's various sides over the season. This included most of the reserves games, including this dour 0-0 draw. Played on an outside pitch, I went with my equally obsessed fellow fan Paul, driving down for this afternoon game after work. We spent most of the time chatting to John Dempster's dad who played for Rushden at the time and who would go on to play for Oxford United & Mansfield Town amongst others.Despite the game being dull and taking support to daft levels, I'm glad I went so I can say 'I was there" and just wish I'd taken more photos. For this visit I travelled with Paul & other mates in my car. Due to there not being much around the ground we stopped at Wellingborough on the way for lunch and I remember being pleased that all the parking in the town was free. On the pitch Wycombe were in poor form, following a double tragedy that occurred at the start of the year. Firstly in January young player Mark Philo was killed in a car crash, then around a month later manager John Gorman lost his wife to cancer. Rushden & Diamonds were fighting against relegation, sitting second bottom, despite 3 wins and a draw in their last 6 games. Wycombe had lost their last 6 games and had just put manager Gorman on sympathy leave, meaning that assistants Keith Ryan & Steve Brown were in charge. It looked to be the same old story when Marcus Kelly opened the scoring for Rushden on 24 minutes. A quickfire double just after the hour mark saw Tommy Mooney and Roger Johnson saw Wycombe take the lead. The win was sealed on 88 minutes when Mooney scored from the spot after a Rob Gier foul in the area which saw the Rushden man get his second yellow card and matching orders. NENE PARK was a great ground but it was always a bit too big for its tenants to maintain, leading to financial issues for both Rushden & Diamonds and Kettering Town. Though the stands were effectively 4 separate structures, the corners were all closed in. It featured 3 sides seating with a capacity of 4,641 and a further terrace - originally named the Peter DeBanke terrace, but altered to the Dale Roberts terrace following the young goalkeeper's tragic death in 2010. The ground was home to Rushden & Diamonds from 1992 - 2011 and local rivals Kettering Town for the 2011/12 season. The ground was part of a wider complex and therein laid the problem. With several outside pitches to maintain and without the demand to meet supply, it was always a challenge to meet the costs of running the site. As well as the pitches there was a Doc Martens outlet which doubled as the club shop and a bar at the ground too, though I can't recall ever going in there. The location did not help, with the venue being located right out in the sticks with poor transport links unless you were lucky enough to drive.